POUR-ONS, SPRAY-ONS and BACKLINERS for veterinary use on LIVESTOCK - cattle, sheep, goat, pig - against external and internal parasites: flies, ticks, mites, lice, blowfly strike, etc. What is a pour-on, a spray-on or a backliner? Pour-ons or backliners are ready-to-use liquid formulations containing one or more parasiticidal active ingredients that are applied to cattle, sheep, pigs or horses by pouring it along the backline, roughly from the neck to the tail. Sometimes they are also called "backline drenches". If the liquid is not poured but sprayed along the backline, they are called spray-ons. A few ready-to-use liquid formulations for topical administration are neither poured nor sprayed along the back of the animal, but applied in a few spots. They are called spot-ons. These spot-ons are much more popular for dogs and cats, popularly known also as pipettes, squeeze-ons or drop-ons. Small pour-on packs up to 1 liter are usually applied directly from the container that is provided with a graduated metering cup for easier dosing. Larger packs are designed to fit with standard commercial applicator guns that allow convenient dosing and administration. Power guns are also available in some countries. Pour-ons are used a lot in cattle, sheep and horses against many external parasites such as flies, lice, ticks and mites as well as against various myiasis, i.e. parasitic maggots of warble flies, blowflies, etc. Pour-ons with macrocyclic lactones (e.g. ivermectin, doramectin) are also effective against internal parasites such as gastrointestinal roundworms. Pour-ons are not suitable for the treatment of psoroptic mange of sheep (Psoroptes ovis) because they do not ensure a 100% control. For this reason they are not allowed for this indication in some countries. Pour-ons are very scarcely used on poultry, other domestic birds or pets. Pour-ons and spray-ons for use in cattle and horses contain mostly synthetic pyrethroids (e.g. cypermethrin, deltamethrin, flumethrin, permethrin) and macrocyclic lactones (e.g. ivermectin, abamectin, doramectin, eprinomectin, etc. ), but for cattle there are also some products with tick development inhibitors (e.g. fluazuron). Synthetic pyrethroids pour-ons target mainly horn flies (Haematobia irritans) and cattle ticks (Boophilus = Rhipicephalus microplus and decoloratus) but have become useless in many places due to resistance of these parasites against this chemical class. As a consequence pour-ons with macrocyclic lactones and more and more used against these parasites. Such pour-ons control also some lice and mite species. All these pour-ons have some efficacy against stable flies (Stomoxys calcitrans), face flies (Musca autumnalis) and multi-host ticks (e.g. Amblyomma spp. and various Rhipicephalus species) and can help to reduce the populations, but they are normally insufficient to control heavy infestations. 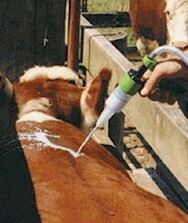 Fluazuron pour-ons are specific for the prevention of cattle ticks (Boophilus = Rhipicephalus microplus and decoloratus. Pour-ons are not used in swine as often as in cattle and sheep. The major use of pig pour-ons is against mites and lice. Such pour-ons contain mainly synthetic pyrethroids (cypermethrin, deltamethrin, etc. ), amitraz, or organophosphates (e.g. phosmet, phoxim). For pour-ons to work properly it is important that after application along the backline the liquid spreads throughout the whole body of the treated animal. This is especially important for non-systemic products, i.e. those that are not absorbed through the skin. To ensure proper spreading the backline must be reasonably clean and the hair coat dry. Otherwise part of the product may run-off to the ground and get lost, which would result in under-dosing. Excessive dirt could also hinder proper spreading and/or absorption of systemic products through the skin. Pour-ons should not be applied by rainy or windy weather. A wet hair coat will hinder correct spreading or the product may run-off instead of penetrating it; and strong winds can blow away part of the product before it reaches the hair coat. For the treatment of highly infective parasites such as mites and lice it is essential to treat all the animals in a herd, also those that do not show clinical symptoms. When using large containers (e.g. 5 liters) with applicator guns, if the container is not collapsible, care must be taken to compensate the vacuum that builds up progressively during emptying: it is enough to shortly open the container to let air in. Otherwise the vacuum resistance can hinder correct refilling of the gun. It must be ensured that the applicator guns work properly and accurately. They must be periodically cleaned, maintained and calibrated. It has been shown for several pour-ons with systemic active ingredients (e.g. macrocyclic lactones, fluazuron) that absorption to blood occurs both directly through the skin and indirectly by licking, either of the treated animal itself, or of other treated animals in the same herd. Therefore licking must not be hindered (at least for a few days after treatment). A frequent mistake (or misuse...) when using pour-ons on cattle is to administer the same dose to all the animals regardless of their weight (and size). This practice favors under-dosing and the corresponding limited efficacy, but keeps the parasites under selective pressure, which can accelerate the development of resistance. Pour-ons are easy and convenient to use when compared with dipping and spraying. A major advantage is that pour-ons are ready-to-use and do not need to be previously diluted in water. This reduces the risk of mistakes when diluting the product. Pour-ons also bear less safety risks for the operators than dips or sprays because there is no need to handle products containing highly concentrated pesticides. Pour-ons do not create the bothersome problems associated with the disposal of dip wash contaminated with pesticides. Pour-ons are more flexible in terms of where and when to treat a herd: it can be done virtually everywhere in a property, e.g. using a portable alley or race. In cattle, a major disadvantage of pour-ons is that coverage of certain body parts (udders, beneath the tail, legs, ears) may be insufficient against some parasites (e.g. several tick and mite species). Synthetic pyrethroid pour-ons can be quite irritant, especially to young animals and dairy cows. Irritated animals can become restless, which can substantially hinder milking during a few days after treatment. Pour-ons are usually more expensive than dips or sprays in product cost per treatment. However, if the investment and maintenance costs of dips and spray races are considered, pour-ons may be the more economic option.